When describing a vessel, it is broken down as an inanimate object and a powerful spiritual messenger. A popular definition is a vehicle used for marine transportation. On the other end of the spectrum, there are illustrations throughout the Bible including II Timothy 2:21, where a person is chosen to be set apart for God’s kingdom. Throughout his three-CD trilogy, Simply a Vessel, singer/songwriter Sean C. Johnson thoroughly embraces his assignment as that special neo-gospel vessel. His transparent lyrics have garnered massive respect within the independent gospel music community. The Oklahoma City, Oklahoma-based Johnson is also unafraid of becoming the street preacher, dropping soul, jazz and hip-hop in a cool, yet forthright manner. While he has not released a full-length effort other than the Vessel series, Johnson maintains a steady flow of unreleased and new singles enough to whet the ‘neo-gospel’ appetite every few months. 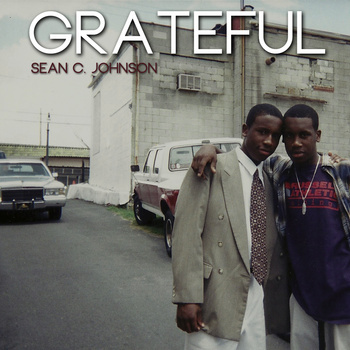 The latest EP, Grateful, is deemed by Johnson as a ‘thank you’ note for the faithful fans and offers a substantial five-track plate of encouragement, admonishment and praise. Three producers season Johnson’s rich baritone and raps with an impressive array of musical tastes. The sophisticated Philly Sound sets the tone for Grateful’s opener, “I Need It,” Johnson’s calling out to God for self-correction and discipline: “I see it every time that you mold me/Chastise and even when you scold me.” “No Never” from Simply a Vessel Vol. III is transformed into a mellow funk remix package draped with electric piano, an old-fashioned gospel quartet and a recollection of old-school church service: “I can hear the old folks sing/I’m sanctified and free.” “Thirty (30)” featuring Shy Speaks and Adam L. is stripped down hip-hop integrating Denzel Washington’s plea to God from the movie, Flight, and intense sermon bits by John Piper, while pointing out the hardships of addiction and misusing sexuality: “I’m probably going to need your grace.” Electronic flavored pop/rock elements a la Plumb and Evanescence grace “Shepherd Me,” the battle between Christians and contradictory scriptural truth: “What bible are you reading from/Because I never heard that interpretation/ You must be working for Satan/ I’m searching for confirmation.” “Silver and Gold” (Neo-Soul Remix) lays down a rumbling acoustic bass and rattling snares for this club praise jam about being simply satisfied with Jesus than any other earthly treasure. Johnson has conceived a very thoughtful thank you present in Grateful. And Johnson’s uncompromising perspective of his faith and shear understanding as a modern day vessel for God conveyed by his humble attitude cannot be overlooked.